Berries are a perfect way to start off a sunny morning -even a weekday one! Blueberries, strawberries, raspberries, blackberries….I just love them all! I hope you have had the opportunity to try my raspberry scones! They are divine. 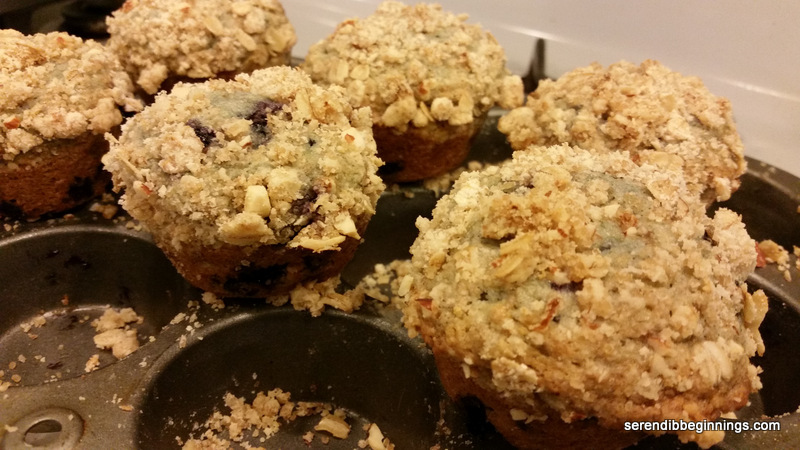 Although I debated another scone recipe this morning, I went for buttery streusel topped blueberry muffin instead. This recipe is adapted from the original at the Café Sucre Farine. 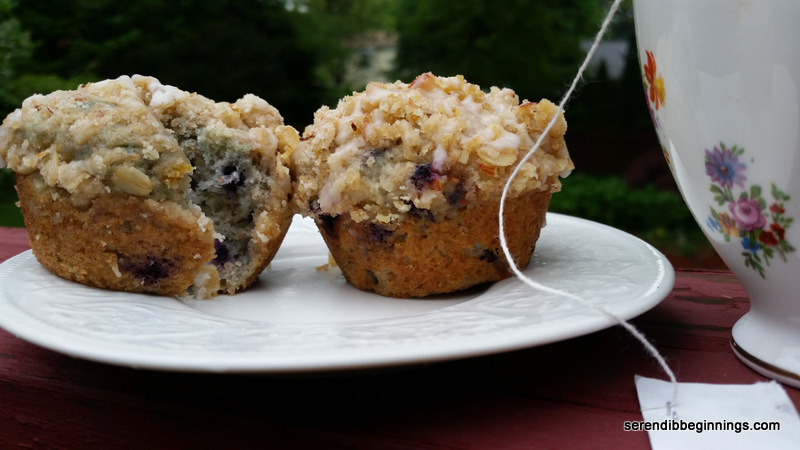 The recipe called for the blissful combination of lemon and blueberries! Heavenly! This recipe is so easy – I mean it. 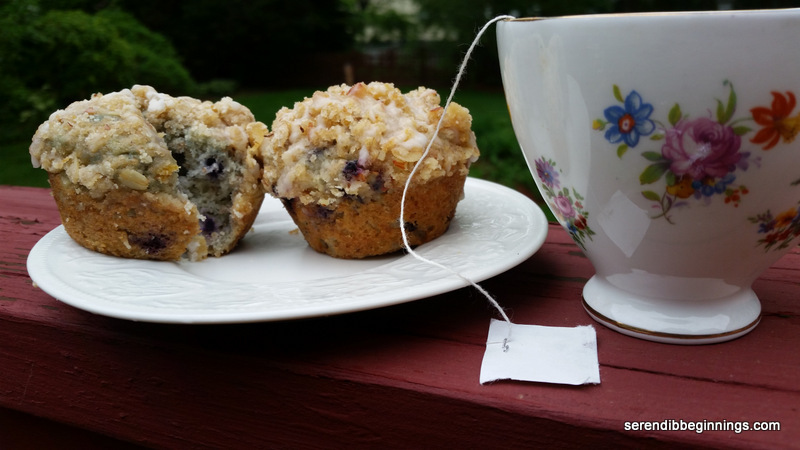 Even though the original recipe calls for creaming the butter and sugar, I decided to skip that step, mainly because I have made several batches of muffins before and I felt confident the muffins will turn out just fine without this additional step. So, grab yourself the basic ingredients I am sure you already have in your pantry and whip up this recipe in time for a great grab n’ go breakfast. 1. Heat the oven to 375F. Spray a 12-cup muffin pan with nonstick cooking spray and set aside. You can also use muffin liners. 2. Prepare the streusel topping by combining all ingredients till crumbly. Set aside. 3. In a large bowl, sift together the flours, salt, baking powder, baking soda and sugar. 4. In a smaller bowl, lightly whisk the eggs. Whisk in the sour cream, curdled milk, oil, melted butter, lemon zest and vanilla. 5. Gently stir in the wet ingredients into the dry mixture just until moistened. 7. Spoon the batter into the muffin pan. Don’t level the batter. 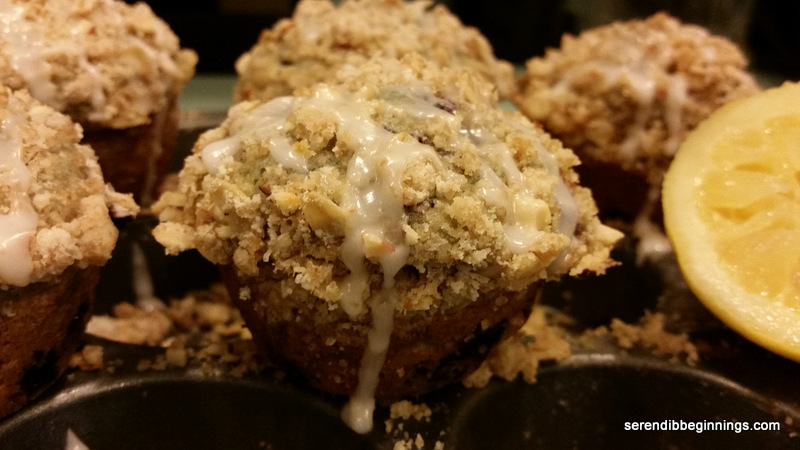 Top with a generous amount of the streusel topping. 8. Bake the muffins for 5 minutes at 375F. Decrease heat to 350F and continue baking for another 20-25 minutes till the tops are golden and the muffin is cooked through. 9. Remove from the oven, let cool in the pan for 5 minutes. Carefully remove the muffins from the tin and let cool on a wire rack till completely cool. 10. While the muffins are cooling, prepare the glaze (optional) by vigorously stirring together the lemon juice and powdered sugar to a “drippable” consistency (say, like honey). 11. Lightly drizzle over the muffins. Let set. 12. Store muffins tightly covered for up to 5 days. No part of this site, or any of the content may be used or reproduced in any manner whatsoever without prior permission of the author.